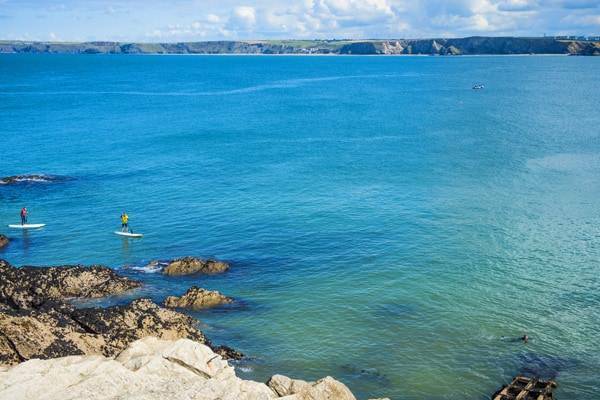 5 awesome stand up paddle boarding locations in Cornwall! A real crowd pleaser, Towan is as perfect as it gets when it comes to SUP’ing (and a whole load of other activities for that matter). It’s why we’re based here and why it’s the heart and soul of our activities. So, what makes it so great? Its unique position for starters. Sitting in the shadow of Towan Head, the beach enjoys protection from big swells and shelter from strong winds which is good news for first-timers. Experienced SUP’ers meanwhile can get their adrenaline fix by riding the waves that break and refract off the rocks and harbour wall. It’s the type of beach that no matter what the tide is doing and whereabouts on the beach you are, there’s a SUP adventure to be had. If you’re a history buff, then strike out from Towan beach to The Gazzle, a 2km stretch of Atlantic coastline still bearing the remnants of a rich fishing heritage, and illicit pirating legacy. The keen eyed will spy the dazzling white of the Huer’s Hut, steadily watching over from the clifftop for the distinctive oily slick of shoaling pilchards and mackerel. For centuries these huts have housed the huers, standing ready to signal the crowds of local fisherman to man their boats. Though today less lucrative, many enthusiasts still cast their lines from ‘Flysellers’ fishing terrace, just North of the harbour mouth. For those with angling proficiency, on a calm day the SUP makes for an excellent platform to land and release local catch, including mackerel, pollock, or the much-prized sea-bass. The Gazzle is also where Newquay’s smuggling past to life, preserved in the recesses of secluded coves, dark caverns and hidden inlets. Those with an appetite for antiquity can follow in the wake of corsairs from days gone by, beginning at ‘Dead Man’s Cove’. Here, the unfortunate couriers of highly valued spirits, spices, and teas were lured onto the shallow rocks, and met their end at the hands of marauding privateers. Scull along the cliff edge to the south, and you’ll discover the eventual destination of the plundered goods: extensive networks of sea-caves. Marked by the fading remains of Victorian sewage pipes and structures, these cavities made ideal infiltration points into the town markets above. Today, these wondrous natural spectacles can be explored by SUP at high tides on calm sunny days, when the light and water’s surface combine to create stunning natural cathedrals, as if hewn by hand into the rock face. Cornwall is famous for its diversity of ocean life, and Towan and the Gazzle are no exception, hosting rich diversities of fish & crustaceans, abundance of sea birds, and surprising numbers of seals, porpoise and dolphins. The graceful, silent elegance of the SUP makes it an ideal podium to witness these wild marvels. Look up, and you’ll observe the swarms of nesting kittiwakes & fulmars, and lazing cormorants & shags. Look down, and your paddleboard transforms into a looking glass to the underwater world below, where kelp forest and rocky reefs provide the backdrop for fish, sea-stars and anemones to jostle for territory, all the while avoiding the hungry gaze of grey seals, harbour porpoise and common dolphins. Though best viewed from a distance, the curious nature of these marine mammals can make for intimate encounters you won’t soon forget. Teaming with wildlife and sashaying with incredible good looks, the Gannel Estuary is an all-round idyllic spot. Positioned just south of Pentire Headland where the Gannel meets the sweeping sands of Crantock Beach, it enjoys a sheltered position tucked away from the buzz of Newquay’s popular beaches. This is where serene rules and where the iconic silhouetted image of SUP’ers was made. Here, where the overhanging trees and rolling countryside on either side create a mellow experience, the calm, slack waters are home to an abundance of wildlife. Best explored at dawn or dusk when the spring tides are at their biggest, keep your eyes peeled for an array of birdlife. At low tides this estuary becomes a Mecca for bird watchers, where wading herons, greenshank and plovers can be seen plundering the sand for burrowing crabs and worms. Other sights include the peculiar curved beaks of Curlew and Whimbrel, distinctive blue flash of Kingfishers, and brilliant white of egret feathers. Visitors here shift with the seasons and are as reliable as the overwintering of wetland ducks like Wigeon and Teal, or as rare as surprise stopovers from distant travellers such as the Dalmatian Pelican or Glossy Ibis, occasionally losing their way on migratory flights. The Gannel’s recent classification as a Marine Conservation Zone (MCZ) means this location and its abundant wildlife will be preserved for generations to come. As well as natural splendour, this estuary holds a remarkable history. Once deeper and broader at its banks, the Gannel was a prominent passage for schooners and barges, ferrying coal & timber to Trevemper bridge further inland. Ancient, splintered vessels, wrecked and still lingering at Penpol Creek, reveal the river’s ship-building past. The Gannel Ship-yard operated here until 1872, and the creek became a mooring site for the museum barge Ada, famously bombed by a German plane in 1940. The ghosts of the past still linger here today, and those with an interest in the uncanny may wish to seek out the eerie presence known to locals as ‘The Gannel Crake’, whose chilling call can be heard in the twilight hours. Whether the cry of a tortured soul, or song of an unknown bird, the Crake contributes to an area of historical & natural beauty that is a true jewel in Newquay’s crown. If you like your paddle with a side helping of views, wildlife and heritage, you won’t find anywhere more fitting than an SUP on the Gannel Estuary. Take our advice though and watch out for the current which can be strong at points and plan your paddle around the tide or you could be left high and dry! 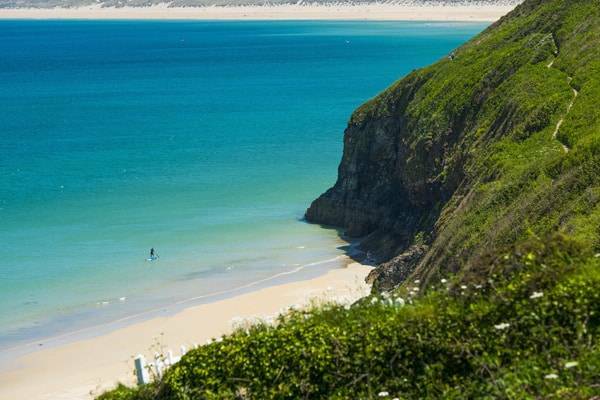 Surf, glassy water, incredible cliffs – Harlyn Bay just south of Padstow has got it all going on. It’s wide, spacious sands, guarded by the stunning profile of Trevose Headland, make for sheltered surf, calm waters, and little wind. In short, a dream for first-time & experienced SUP’ers alike. 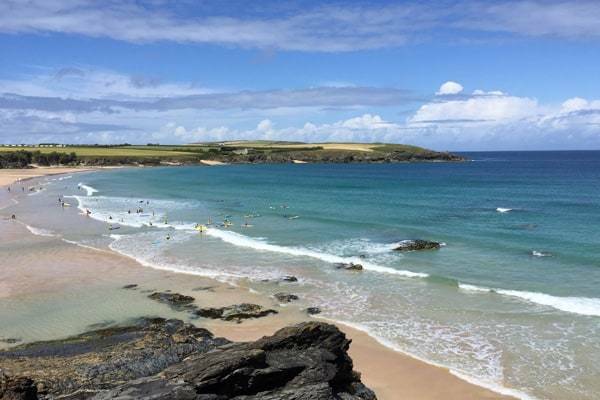 Launch from the far-left side of Harlyn beach and paddle across the turquoise bay towards Trevone, and expect to be blown away by the coves, rock formations and far-reaching views. Eons of ocean power, wind & water, have sculpted grey slate into grand archways and veiled crags. On calm days, glide into the shadow of the cliff face and admire the silent might & wonder of a Cornish bluff. When the sun is high, jagged precipices make way for dazzling golden sands and shimmering surf, inviting you back in to shore. But don’t stop for long! Harlyn Bay is a feast for the eyes, embellished by its marine wildlife. High tides unlock pools and rocky shore life, finding refuge close to the shifting surge of the rock face. Look down in deeper waters and things get even more stunning, with an array of fish enjoying the crystal-clear water. Observe from an elevated position or take a plunge into the pure waters for a closer look. Larger seasonal visitors are known to enjoy the shelter of the bay too, and fortunate paddlers may spy the fins of dolphins & porpoises, or bottle-shaped outlines of bobbing seals. If you can pull yourself away from the natural serenity, this beach has more to offer than just spectacle. Harlyn is famous as a perfect beginner surfing spot, combining calm winds & smaller swells, to form gentle peeling waves. However, when the swell’s big and wind hits from a South-Westerly direction, Harlyn is transformed into a fast, hollow ordeal. Best at mid-tide, steep take-offs offer rewarding, makeable sections for those with guts. For the SUP’er looking to expand their abilities, there’s rides of all intensities to be won and adrenaline levels to be pushed. All in all, Harlyn Bay is a diverse SUP route that just keeps on giving! At the end of its course, the river Hayle spills out into Cornwall’s North coast. Here, tidal forces have carved an elegant horseshoe, shielding the land at both ends from the formidable forces of the Atlantic. Nestled within this crescent, the beaches of Gwithian, Godrevy & Carbis make up St Ives bay. If it’s good looks you’re after, St Ives bay has it all. This three-mile stretch of sand features an extensive dune system, a pristine backdrop for SUP adventures. Embark from Carbis bay and discover the captivating coastline to the bay’s west side. As with much of the North Cornish coast, concealed grottos & great fissures of rock can be found in abundance, fortifying hidden coves and beaches. Committed voyagers can sweep round the coastline, as it opens out into the popular Porthminster beach, and St Ives’ cultural hub. The bustling coastal town is active all year-round, but the sights, smells & sounds of a Summer day can be felt from out on the water, compelling you forward as you flank the shore. Famous views from here include the Tate Gallery, Barbara Hepworth Museum, and Tregenna castle, standing watch over the seaside haven. More audacious explorers can head East from Carbis, and cruise along the shoreline towards Gwithian beach. Wildlife comes here in droves, and at the mouth of the Hayle river, wading birds feed all year round. Beyond the breaking waves diving comorants are common place, as well as grey seals, out hunting and occasionally spooking surfers when surfacing. If the stunning natural décor isn’t enough, Gwithian & Godrevy offer consistently excellent surf. Though waves at Godrevy can be on the bigger side, the sheltered nature of the bay means Gwithian in the centre stays more subdued. This makes for excellent conditions to throw in your hat at SUP surfing, allowing you to progress on to more challenging waves when ready. Medium swells (2-6ft) with Southerly winds offer optimum conditions to catch an amazing ride (or a barrel! ), all under the gaze of Godrevy’s famous lighthouse. With the most amazing blue water beneath you, stunning golden stretches to one side and iconic landmarks to the other, this is the achingly beautiful backdrop that your SUP selfies have been looking for. If we could ever be tempted to dip our paddles away from our north coast homeland, Falmouth would be the place to do it. Here, rolling waves are replaced by calm, slack water, and surfers trade in adrenaline fuelled rides for the mellow serenity of the sail or paddle. This is a place where two great rivers meet, and where the curious will find an area inundated with wildlife and dripping with treasures to be unearthed. The award winning Gyllyngvase, or ‘Gylly’ beach makes the perfect start point for your SUP adventure. This arc of golden sand could have been plucked straight from the Mediterranean, and with its sapphire waters and pristine green cliffs, it’s no wonder it’s received blue flag status. On a high tide, Head East towards Swanpool beach and you’ll be rewarded with a myriad of rocky shore life. 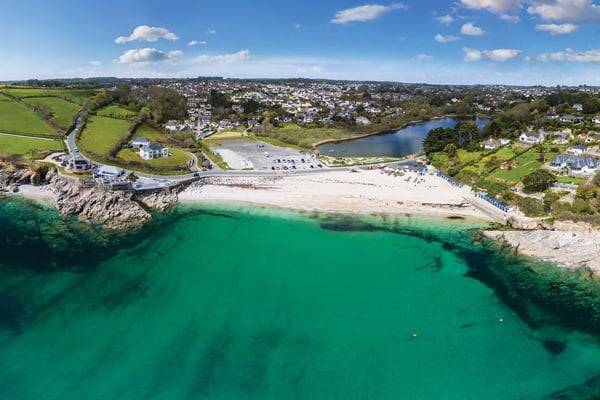 Falmouth is one of the most southerly stretches of coast in the UK and blessed with an exceptionally mild climate. Combined with the sheltered position of the bay from strong wave action, huge abundances of ocean critters are left undisturbed to flourish in the temperate shallows. Peek under the surface, and you’ll lose count of the different numbers of fish, crustacean and jelly species. Common sights include the charming mating dances of Common Cuttlefish, exquisite colours of Tompot Blennys, and still beauty of sea-stars. Dismebark at Swanpool beach to experience the famous Swanpool Nature Reserve, an area of brackish water once connected to the sea, now teeming with bird-life. Over 100 species have been recorded at this site, and in Spring & Summer months the reserve is a true spectacle, as swathes of tufted ducks, grebes, mallard, coots and siskin come together to create an awe inspiring display. Paddle West from Castle Beach, and the scenery shifts dramatically. Shallow blue pools make way for imposing cliffs and precipices, natural armour for the coastline. Garrisoned atop these wild walls is Pendennis castle, a nearly 600 year-old artillery fort which stands guard over the bay. Follow the cliffs around the cape, and you’ll be met with the Fal estuary. Known to locals as Carrick Roads, this natural harbour is the third largest of its type in the world, reaching depths of 34m and never less than a mile across. In warmer months the river mouth is populated with hundreds of sailing boats & yachts, making use of the extensive range and peaceful waters. Join the flotilla and explore the sheltered channels which meander into the countryside. As well as a prolific fishing spot, the estuary is an idyllic spot for wildlife, home to a multitude of sea birds, and along its banks, fallow deer, peregrines & buzzards. If it’s natural beauty you’re after, then Falmouth Bay is bursting at the seams. With its combination of aquatic & bird life, dramatic coastlines, and pure blue waters, the bay brings the beauty of the continent right to the Cornish south coast.